sends messages directly onto the transmission medium. message is addressed to its own physical address. address assigned to each system in a network. 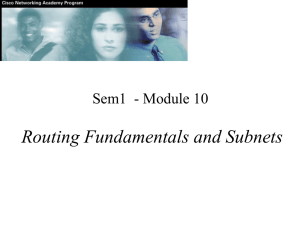 This works in Layer-3 of OSI Model. 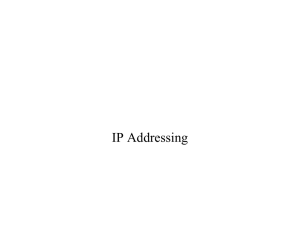 This would be generally the IP address. but the logical addresses usually remain the same. address to connect to the right application? The answer: Ports. Layer) which identify the application on the host. 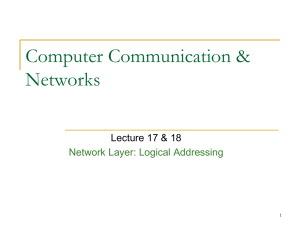 example, a computer or a router) to the Internet. 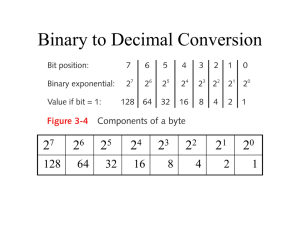 byte is separated by dots. An IPv4 address is 32 bits long. The IPv4 addresses are unique and universal. 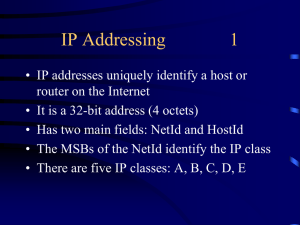 • An IP address is a 32-bit sequence of 1s and 0s. The address space of IPv4 is 232 or 4,294,967,296.
addresses for its own research. Find the error, if any, in the following IPv4 addresses. a. There must be no leading zero (045). b. There can be no more than four numbers. 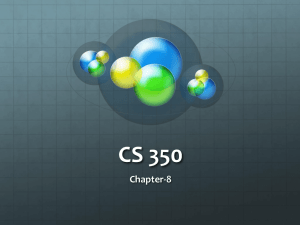 c. Each number needs to be less than or equal to 255. Find the class of each address. a. The first bit is 0. This is a class A address. c. The first byte is 14; the class is A.
d. The first byte is 252; the class is E.
hence in this first 8 are 1s. /n i.e 8 or 16 or 24 shows the mask for each class. 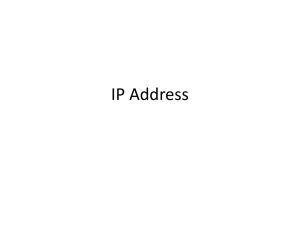 Network portion and the Host portion of the address. Suppose we have the address of: 206.15.143.89? What is the Network Address? What is the host portion of the address? host portion of the address (Reserved address). has no more than 30 hosts on it? and breaking it down to create more Network Addresses. 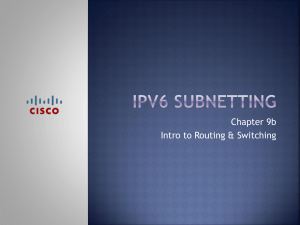 Subnetting makes more efficient use of the address. We ask our ISP for a Class C license. for 254 host addresses (206.15.143.1 to 206.15.143.254). 11111111 addresses are not used). We know we need at least 25 hosts per network. 25-2 will give us 30 hosts per subnet (network). Network) address and which will be our host addresses? •We are left with 6 useable network numbers. 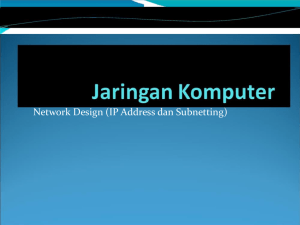 first number AFTER the network address shown before. Class A and B sites, etc. 1. The address in a block must be contiguous. Figure 19.3 shows a block of addresses, in both binary and dotteddecimal notation, granted to a small business that needs 16 addresses. divided by 16 results in 215,024,210.
rightmost 32 − n bits to 0s. rightmost 32 − n bits to 1s. Find the last address for the block 205.16.37.39/28. Find the number of addresses in Example 19.6.
of addresses is 2 32−28 or 16. (twenty-eight 1s and four 0s). c. The number of addresses. the result is 0 otherwise. to 0 and each 0 to 1.
number, and adding 1 to it. the organization to the rest of the world. IP addresses have levels of hierarchy. In North America telephone network has 3 levels of hierarchy. level defines the connection of the local loop. addresses between the different networks. entity; however internally has several subnets. 3. All messages are sent to the router, router routes to subnets. addresses. Find the new masks. 1. The first group has 64 customers; each needs 256 addresses. 2. The second group has 128 customers; each needs 128 addresses. 3. The third group has 128 customers; each needs 64 addresses. permission from the Internet authorities. they are not unique globally. through Router that runs the NAT software. source address in the packet with the global NAT address. also makes note of the destination address. An ISP that serves dial up customers can use NAT to conserve addresses. addresses in outgoing packet to one of the 1000 global address. specified in hexadecimal colon notation. 2 bytes in hex notation requires 4 hex digits. and contains many digits are zero. • The leading zeros of a section are omitted. Expand the address 0:15::1:12:1213 to its original. 0s we need to replace the double colon. This means that the original address is. address and sends an inquiry to find its address. Compatible is used during the transition from IPv4 to IPv6. network that still operates in IPv4. To start with, all the requests are rounded up to a power of two.